Posted by sneaks in DVDs. 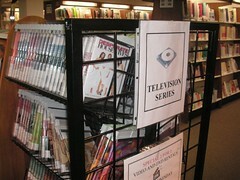 Have you thought about gathering all your TV DVDs in one place, as Cockeysville has? If a patron has ever sent you in search of, for example, Season 3, volume 2 of the Sopranos, you know how frustrating the search can be. If they’re all in one place, it’s easier to keep all the DVDs from a particular show grouped together. Not to mention, the long rows of similar spines are eye-catching.